Youve Been Reviewed: Think outside the box - plan a ‘theme’ vacation! Think outside the box - plan a ‘theme’ vacation! You know the big thing now days is ‘destination weddings’ where the bride and groom pick an island in the middle of the ocean or the top of a far away mountain and all the friends and relatives jump on a plane or ship to enjoy the wedding and festivities. Well, why not a ‘theme’ vacation? What is that you ask? Here is an example, a very good one actually! I have a friend who loves roller coasters. He and some of his buds plan their summer vacations around which amusement parks have the best coasters and off they go to get their thrill rides! The photo is of a coaster he rode outside of Cincinnati, Ohio – I get chills just looking at the photo! I am thankful he let me share this photo with you. Some amusements parks might be in driving distance, while other require a plane ride. A few years ago my friend wound up here in Tennessee and visited Dollywood and tried out some rides there. Dolly now has added a brand new coaster, a wooden one, and I bet he would love to give it a whirl. OK, so you don’t ‘do’ coasters, neither do I! But there are as many ‘theme’ vacations as your imagination can come up with. What about a flea market vacation? Do some research and find out where the biggest and best flea markets are and plan a vacation around them. If you are a shop-a-holic I bet an ‘outlet mall’ theme would work well. There are outlet malls all over the US – just pick a few of the best, load up your wallet, put on your comfy shoes and head out shopping. There are many National Parks across this great land. 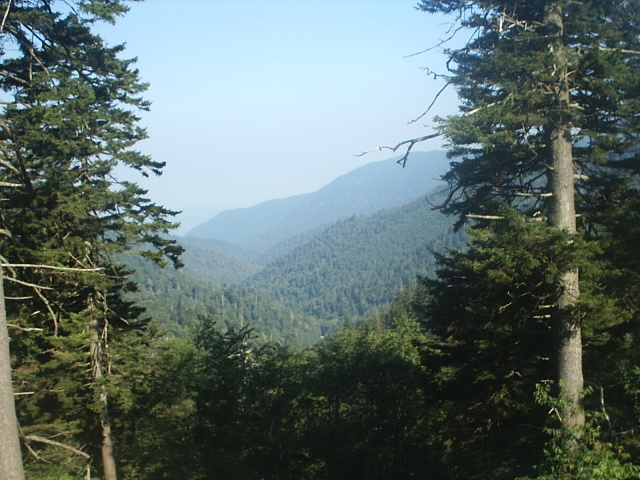 The Great Smoky National Park is the most visited of the parks! No matter what time of year you visit the views are amazing. What about a zoo vacation? Most major cities in the US have a zoo and if you are vacationing with your kids they would love seeing all the animals. To honor those who have died for our country maybe vacations centered around our many National Cemeteries. This may sound morbid to some of you, but those who are buried there gave their lives for us and we should respect and honor them. My husband and I pick a vacation area based on restaurants. Yes, we sure do! We don’t do the typical tourist stuff but we do not miss a good restaurant! If I hear of a great restaurant in “some town USA” I will research it and find out if there are more good eateries in that area. If so, then I next search out vacation rentals that are pet friendly. Those are just a few examples of ‘theme vacations’ and you can probably come up with some ideas of your own. Whatever you do, wherever you go – enjoy your vacation! Roller coaster photo courtesy of John Myers and it is used with his permission. All other photos belong to AbbyG.